That, subject to the approval of Congress, the coinage of the United States silver half-dollars during the calendar year 1932 shall have a commemorative character. That the obverse shall bear a head of Washington based on the Houdon bust at Mt. Vernon. That the design of the reverse is left to the sculptor, with the proviso that is shall be national in conception. The clear winner, in the opinion of the Commission of Fine Arts, was Laura Gardin Fraser, the accomplished sculptor wife of James E. Fraser, whose Buffalo nickel design had already won wide acclaim. Congressional approval was required for any new coin design, since current designs at that time were all less than 25 years old (coin designs more than 25 years old needed only the consent of the Treasury Secretary to be replaced). 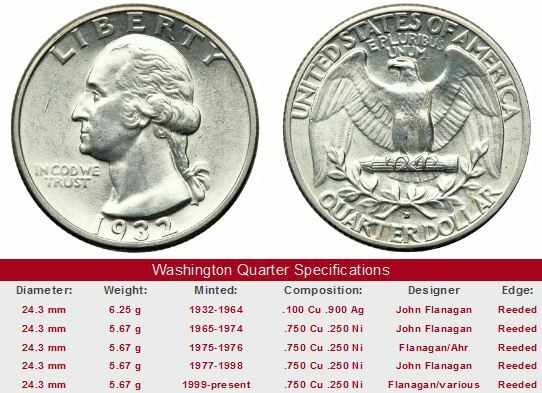 Ultimately, Congress decided that a new Washington quarter should be issued to replace the Standing Liberty Quarter, not a one year commemorative half dollar, as the announcement above stated. The Act of March 4, 1931 made it official. After Congress authorized the new quarter, the Treasury Department initiated another contest. The Commission of Fine Arts strongly recommended to Treasury Secretary Andrew Mellon that Fraser's design be adopted for the new quarter. Mellon refused, and proceeded with the competition. More than 100 entries were submitted on October 27, 1931, including Fraser's design, modified to fit on a quarter. Also among the contestants was John Flanagan, a former student of the famous sculptor, Augustus Saint-Gaudens. Once again, the Commission favored the work of Fraser, but Secretary Mellon preferred the design of Flanagan. I have given further consideration to the subject and am constrained to adhere to the decision of my predecessor, and I select that model [Flanagan's]. You will realize, of course, that the duty of making the selection falls upon the Secretary of the Treasury and not upon the Commission of Fine Arts, the function of that body being purely advisory. The new Washington Quarter was officially released on August 1st, 1932, and has been with us ever since. As for Laura Gardin Fraser, who many felt was the most deserving in 1932, she belatedly received a great honor. In 1999, 33 years after her death, her Washington design was selected to grace the the commemorative half eagle observing the 200th anniversary of the death of our first President. The Bicentennial of the United States was celebrated with great fanfare on a national scale. In October 1973, the Treasury Department announced plans to sponsor an open competition for bicentennial themed reverse designs of the quarter, half dollar, and dollar. The winners received $5000 each. The entry selected for the quarter reverse was created by Jack L. Ahr. It featured a Colonial drummer, with a victory torch encircled by 13 stars. Coins with Bicentennial reverses were minted throughout 1975 and 1976. The obverses were unchanged, with the exception of the 1776-1976 dual date. 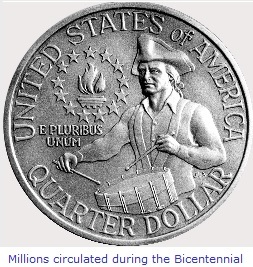 Nearly 1.7 billion of the Bicentennial Quarters were released into general circulation. This website, US Coin Values Advisor, has compiled an in depth value trend analysis of George Washington Quarters. Long term price movements for individual dates are presented in tabular format. The idea of the tables is to show collectors which Washington Quarters have fared the best in the past in terms of price increases. Key date Washington Quarters are not extreme rarities, but a number of the common 1932 Philadelphia issues have been altered to resemble coins from the Denver and San Francisco mints. Before you purchase a 1932-D or 1932-S, insist on locating one that has been certified by one of the four top grading service companies: PCGS, NGC, IGC, or ANACS. If the coin is not certified (often called "raw") by one of these services, then be sure the seller is someone of good reputation. The left hand side of each "Sales Box" is value trend data over a very long period of time for a coin of that date in F-12 condition. The percent annual increase is computed for comparative purposes. The coin pictured for sale in the right hand side is not necessarily the same condition coin as that represented in the value trend analysis on left hand side.